Enter the third derivative of the latest generation of Volkswagen’s iconic Golf – the Golf SV. As with the out-going Golf Plus (which was a rare machine on UK roads though peak sales in in 2006 were just under 9,000) but sales were much stronger through mainland Europe). Essentially it is an extended version of the regular hatch back model, a little shorter than the Golf Estate but somewhat taller. 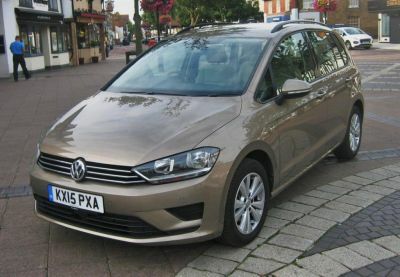 My test experience, somewhat influenced by an enthusiasm for the Golf Plus, is that those who are seeking the proven credentials of the Golf allied to seriously spacious comfort, would do well to check this one out. Open a rear door and just look at that space, plenty of leg room and yes there is also room to fully utilise those picnic tables, stretch out and with a lofty roof to encourage occupants to don an outlandishly large hat. For its size, the luggage capacity is also pretty useful (and is adjustable by sliding the rear seats on rails) plus it is augmented both by a 40-20-40% split fold rear seating arrangement and by full length roof rails. Maximum storage inside the car is a whacking 1,520 litres -a gain of 70 litres over the Golf Plus. Loading platform iks also conveniently low. The Golf SV is no compromise, being based on the same impressive underpinnings as the Golf and Golf Estate, thus it is a positive and light driving vehicle with great road holding, a well insulated ride, a very satisfying level of driver comfort and responsive controls, though the 5-speed manual gearbox felt a bit on the stiff side and with nearly 100 bhp from the 1.5 turbo diesel engine I felt it could easily cope with the sixth gear. Alternative on some models in the extensive line-up is the cost extra option of the highly rated double clutch DSG selectable automatic transmission. The model line-up starts with the S model, the SE (as tested) and up to the GT flagship. Blue Motion higher efficiency versions are also offered on certain specifications. Common to all versions is Stop+Start emission/fuel saving system plus energy regeneration under slowing and braking. All models are equipped to extensively high modern standards, safety is prioritised notably in the form of a seven airbag system, including one for the driver’s knees, this SE version also coming with adaptive cruise control with front assist and city emergency braking. On the road the driver’s lifestyle is to a high standard, very supportive seat, good pedal position, good vision and should one get a bit tired there is a driver alert system and ultimately a pre-crash preventive occupant protection system. The driver should be impressed by the fascia presentation; comprehensively instrumented with easy read dials and with a fascia that is the expected quality act from a Volkswagen product. Panel fit is impressive for the accuracy … still the benchmark in the class. Performance gives an impression of nimbleness, especially on winding roads where pick up from low speeds is commendable, the sort of characteristics that satisfy all types of drivers, even the discerning ones I suggest. Top speed is a claimed 119 mph with 62 mph (100 kph) being reached in a respectable 11.3 seconds. The best bit of news is that the combined fuel consumption figure is 72.4 mpg, so if you can’t see around 50 mph you probably forgot to change up a gear! 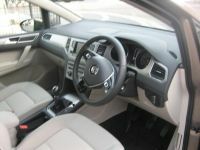 In summary, the Volkswagen Golf SV could just be the ticket for those seeking an honest to goodness vehicle that has not resorted to the more aggressive styling of the so-called SUV or crossover class, rather majoring on the practicalities of modern motoring and delivering it with a bullet-proof standard of engineering and build quality. I say it has the CV and DNA to win over serious minded motorists. Rivals: BMW 2 Series, Renault Megane Scenic, Peugeot 3008, Mercedes-Benz B Class. Just a month after questions relating to the CO2 figures measured on some of the Group's models arose, Volkswagen has issued a statement clarifying the matter. “Following extensive internal investigations and measurement checks, it is now clear that almost all of these model variants do correspond to the CO2 figures originally determined. This means that these vehicles can be marketed and sold without any limitations. The suspicion that the fuel consumption figures of current production vehicles had been unlawfully changed was not confirmed. During internal re-measurements slight deviations were found on just nine model variants of the Volkswagen brand. These model variants will be re-measured by a neutral technical service under the supervision of the appropriate authority by Christmas. In cases where the correctness of original figures is confirmed, there will be no consequences. These cars can be offered for sale by dealers without any reservations. In the case of any deviations, the figures will be adjusted in the future in the course of the normal processes as required."